that, outside of the familiar cradle of friendship, enriched with fine food and cosiness, a surprise emerges, from over the hills or out of the blue; something which had been modestly hidden, but which burns as the craze of a smouldering fire. This happened to me in the friendship with Antonio Corbo, between a smile and a handshake. The consistent series of works (intimately linked by a thin thread that seems to vanish in the course of time) that I became acquainted with through this discovery, evoked something familiar in me, familiar but also unknown, and that can be traced back to the past, to crucial moments in the history of twentieth-century art: Kate Kollwitz, Egon Schiele, Emil Nolde and Paul Klee, Kupka, and – which is only apparently surprising – to Giulio Paolini. The tendence of a historian to draw comparisons, to find analogies, references, interpretations and recurring topics – consciously or not from the part of the artists – may appear artificial or excessively determining, when one just attempts to sketch some critical line, but it nonetheless opens a way to measure the depth and potentialities of a possible research. “Three faces looking at us” is the title of one of the drawings of Corbo’s early production from the 1960s, and it is not the only one. Many anonymous but intriguing ‘portraits’ of a humilated mankind (by hunger, war or loneliness) ask for the attention of the beholder, or even for his compassion, and the setting back of indifference. And “they look at us” with “Desperation”, “Fear and meekness”, or even by showing explicitly “The horror of war”, as other sharp and vigorous drawings from the first experimental period. Indeed, they look at us, nearly as did Giulio Paolini in 1967 – although with other “conceptual” and “poor” intentions – when he presented the reproduction of a portrait by Lorenzo Lotto dated 1505, a painting where a young woman is fixing the beholder (or the artist himself) and which refers, as has been suggested, “to an old conversation tête-à-tête in which both the painter and his partner are vanished. But the beholder always remains, without any limit.” In fact the model does not accept “in front of the artist her motionless position and is being ‘looked’ at by an active beholder.” (Mirolla, 2002) During these same years, however, Corbo was active in the trade unions, socially and politically engaged, and thus the concrete ‘presence’ of suffering overwhelmed any possible conceptual framework. A “universal grief” maybe – as has been hypothesized in a discussion of the early work of the painter, then active in collective exhibitions, which (organized mostly for the end of benefit) may be viewed as “larger communities” – that transcends the here and now, but which does not stop to denounce sorrow and suffering, sometimes caused by natural disasters, but for the most due to political and historical abuse. In the 1960s and 1970s Cobo concentrates on expressionistic drawings and graphics, among which a large series of posters. But above all he discovers the landscape, working intensively on it till the 1990s. Gradually, the graphic signs are limited to purely figurative elements and painting presents itself, in audacious perspectives and effects, and in imaginary transfigurations. “The cry of sorrow has penetrated the rock”, he wrote in one of his poems, an discipline in which Corbo, in addition to drawings, paintings and aquarelles, is testing his own sensibility. And “threads of intense life and threads of broken lifes” are interwoven with the lines of “fields under the sky”, an encounter of literature and painting. Van Gogh was a painter and a writer, deliberatedly crossing graphic sign and painting, because he was convinced – as he stated – that both are equally “interesting” and “difficult.” A conviction, as is well known, that he shared with many twentieth-century artists. A coincidence of dreaming, hope, expectations, and prayer. The presence of some paintings from the 1990s in this exhibition by Antonio Corbo allows us to connect the “threads” and “lines” of an early period with the present works, although in a radically changed context of research. The names of Nolde and Klee, that I mentioned at the outset, are again usefull for letting emerge inconscious references, far echoes. Looking at “Sunrise” (1992) and “Marshes” (2009), the beholder perceives a subtile intermingling of colours and lines articulated by overlaps, series, palimpsests, by impressions and recollections, from which whirlpools emerge, as well the need of order and rationalisation. 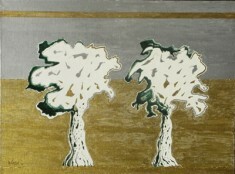 Yet, “Connection” and “Photograms”, which date back to the production of the first years of this century, just like “Green trees” an “Blue tress”, are strictly linked to earlier works. But something new emerges and forces its way, that is, the matter on the sheet, unbound and autonomous, accompanied by the clefts that it traces in its own course. The green and blue trees arise by the filtering flowering of the colour which runs on the surface and assumes its form, like grains of matter that develop intertwined either in whirlwinds, or in effusive golden and silver geometric lanes, ventilating a new interest of the painter, on which he concentrates now, that is, the origin of the universe and of the several forms of life. A return to the origin of things that puts to the test figurative representation, sometimes nullifying the latter, and that, in a totally informal way, entrusts itself to matter and to signs, in their surprising autonomy.